In order to get to Minneapolis, Texas may have to take a trip to Utah. On Sunday, Texas was awarded the fifth overall seed for an NCAA Tournament that will get underway later this week. Texas was denied a top-four seed for the second straight season. The Longhorns will host matches during the tournament’s second weekend only if they survive the first two rounds and No. 4 BYU loses one its first two matches. This year’s Final Four will be held at the Target Center in Minneapolis. Stephen F. Austin (32-2), Texas State (26-6) and Rice (24-6) will be greeted at Gregory Gym by Texas (20-4) over the first week of the NCAA’s tournament. The Longhorns will play Stephen F. Austin on Thursday night. The victor of the clash between the Longhorns and Ladyjacks will battle the Texas State/Rice winner on Friday. Winners of 10 straight matches and the Big 12 championship, Texas claimed victories this season over the teams listed ninth, 14th, 20th, 21st and 24th in the most-recent RPI rankings. Three of the Longhorns’ four losses were dealt by Stanford and Wisconsin teams that were ranked first and sixth. Texas was third in the RPI rankings, but No. 14 Baylor was the only team from the Big 12 that reached the postseason. UT’s cons outweighed its pros in the mind of the NCAA’s selection committee. The fourth overall seed was given to BYU, which went 27-1 this year and handed Stanford its only loss in August. The Cougars, though, were ranked fifth in RPI and recently lost outside hitter McKenna Miller (3.25 kills per set) to a knee injury. “We thought we were deserving of the four seed based on some of the criteria that goes on. Apparently, they didn’t see that. That’s what happens when you are a coach, you sometimes don’t get what you want,” said head coach Jerritt Elliott who added that UT still got what it felt was a good seed. Elliott conceded that a loss to Kansas hurt UT’s chances at a top-four seed, but he argued against the strength of BYU’s overall schedule. The NCAA sent three conference champions to Austin for the first two rounds. The Southland Conference’s finest, Stephen F. Austin has won its last 29 matches. Texas and Stephen F. Austin last played in 2006, and UT owns a 6-1-1 lead in the all-time series. “I know they’re all great players, but we’ve just got to focus on playing our volleyball and not getting focused on everyone else,” Hahn said. The Longhorns entered Saturday’s sweep of West Virginia with the nation’s third-best hitting percentage, and that percentage climbed to .308 after a sweep of the Mountaineers. 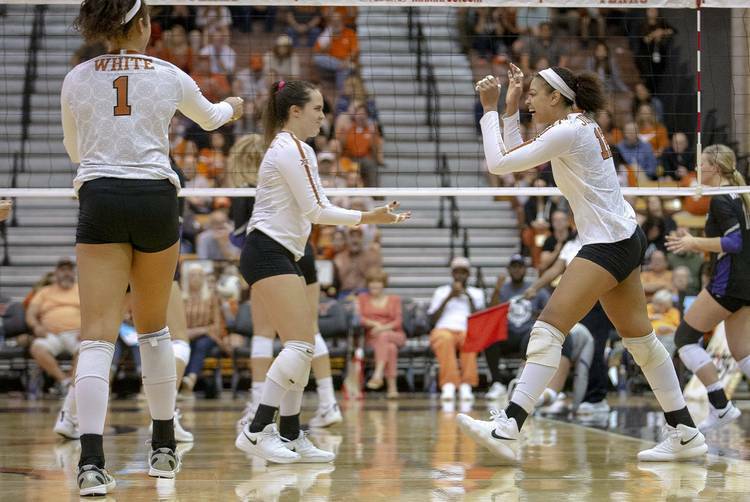 UT’s three-most veteran attackers — seniors Yaazie Bedart-Ghani and Morgan Johnson and redshirt junior Micaya White — are each hitting over .300. Freshman middle blocker Brionne Butler boasts a .363 hitting percentage while freshman outside hitter Logan Eggleston has hit .248 on 636 swings. Butler and Eggleston are two of the four freshmen that UT starts on a regular basis. Sydney Peterson has been the team’s libero the entire season while Jhenna Gabriel took over the setting duties at the end of October. One freshman who won’t be contributing in the postseason is outside hitter Katarina Luketic. Recruited out of Croatia ahead of this season, Luketic is not with the Longhorns. Elliott said he doesn’t expect her to return to the program, but declined further comment. In 11 matches this season, Luketic averaged 1.9 kills per set.